Ferrino Proxes 6 Family Tent is a tunnel-type 3-room structure for 3-season camping, with a huge waterproof rating and several doors and windows. Ferrino Proxes 6 Family Tent. This tent is available on Amazon and I have seen it on several of their global stores. So check the link and save on shipping if you find it in your local Amazon store. This Ferrino Proxes 6 is a part of the series that also includes the Proxes 5 and Proxes Advanced 5 tents. So what you have here is a tunnel style tent with 3 rooms. The sleeping area is a tent within the tent and you have a removable divider inside. The front room is a large living area with doors and windows. So this is a hybrid double-single layer quite frequently seen in tents of this type. The picture below shows the inner area. The tent is not freestanding, so bear this in mind when you plan your camping place. This is almost always so with tunnel tents but there are some nice exceptions of course. View inside from the front door, the inner tent with sleeping rooms on the back. The picture above shows how great it looks with its three rooms and the high ceiling with the peak height of 82.7 in (210 cm). The door on the right is the only one with mesh. Capacity-wise, the manufacturer’s declared capacity is 6 people. But the area is 167 ft² (15.5 m²) and for such a number of users this gives 28 ft² (2.6 m²) per person. So this is clearly more than enough. On the other hand, in the case of a group of friends at a summer festival or concert, this tent can easily accommodate twice as many because the front room is with a fully sealed floor and you can put pads on the floor and be fully protected. Note that the front room alone offers 8 square meters of area, see the floor plan below. Seasons-wise & climate-wise, the tent comes with a huge waterproof rating (more below), the floor is fully sealed so you definitely have all the protection needed for 3-season camping. All the mesh areas can be closed with panels so this is a tent that will perform well even in a cooler climate. Weight-wise, with 32 lb (14.5 kg) this is far from a lightweight tent. But you will see how it compares with some of its competitors, there is a comparison table below, in fact it is lighter than its competitors. This is a camping tent and the weight should not be a big deal in any case. The packed size is 26 x 11.4 x 11.4 inches (66 x 29 x 29 cm) and I think this is quite good in view of the area which it offers. There are three fiberglass poles, all equal length and shock-corded, so the setup is simple, there is nothing to guess. But this is a material that needs some care and most problems appear because of the poles. You also have a full set of steel pegs in the package, 11 in total. The tent attaches to the poles through sleeves and through 12 clips on the sides, and you also have 6 points on the perimeter with pin and ring poles’ attachment to the base. The shell is 70D Diamond polyester, 75 g/m², coated with thermal-insulated aluminized polyurethane, and its waterproof rating is 2000 mm. The inner tent is a water-repellent, breathable polyester. 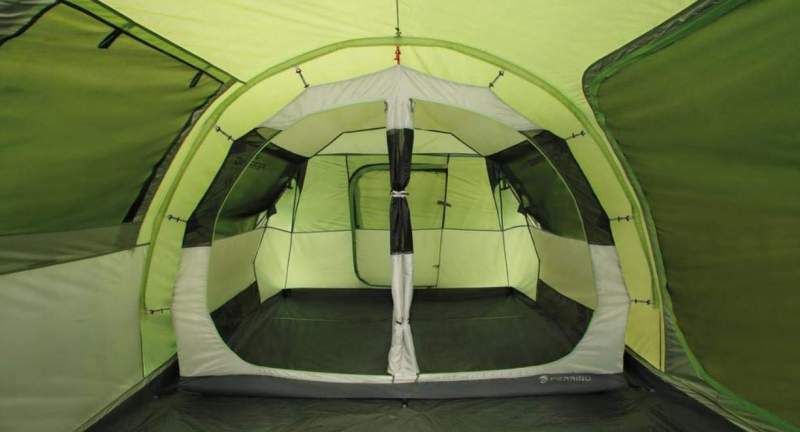 The inner tent floor is also 70D polyester, but 80 g/m², and its waterproof rating is 2500 mm. The main tent floor is a fully welded polyethylene with the waterproof rating exceeding 10000 mm. So you have two floors in the sleeping area, and one thick floor in the front room. All seams in the fly and in the inner tent floor are taped. Clearly, there is nothing one could object to such features. You have the front, side, and rear entrance, but note that only the side door is a double layer with mesh and panel. So their other tent Ferrino Chanty 5 tent offers more comfort with mesh on all the doors. There is a large window in the living area, with a mesh and a panel. The ventilation is based on four high vents, two on the front and two on the back. So they can stay open all the time. But one door and the window are with mesh so you can have extra ventilation whenever the sky is clear. I miss seeing a floor vent here, pity they did not add it. But when the sky is clear you can unzip the front and back doors a bit and have extra air circulation. Sleeping area doors with mosquito net. Multi-point guy-line system for structural resistance in case of strong winds. Dimensions: 165.4 x 149.6 in (420 x 380 cm). Area: 167 ft² (15.5 m²). Area per person: 28 ft² (2.6 m²). Peak height: 82.7 in (210 cm). Packed size: 26 x 11.4 x 11.4 in (66 x 29 x 29 cm). Please see how this tent compares with two other tents with the same capacity and built in the same style. This may be useful to better understand its features and to make an informed decision. As you see it is smaller than the other two but it is a bit taller. All of them are expensive tents. 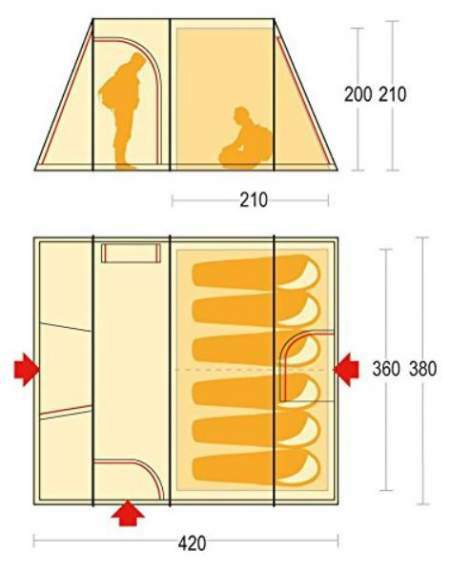 In the summary of this Ferrino Proxes 6 Family Tent review, I would stress again the nice dimensions of this tent that offers lots of space for users and it can accommodate more people than what the declared capacity tells you. Pity they did not add mesh on all the doors, so if this is the problem, check their Chanty 5 tent which is a deluxe model. If you want something completely different, check this Winterial 6-7 Person Teepee Tent which is a great 3-season camping option and light enough even to be carried on the trail. Note that this is not a sponsored text and I have no relation with the manufacturer. Please use the comment box below in the case of questions or comments.